While performing a Factory Grade® assessment, IMCORP found partial discharge(PD) activity near a separable connector (T-body) termination. Visual inspection of the termination showed no indication of a problem. The termination was decontaminated, void filling grease was reapplied, and the cable was reassessed. The PD performance remained unchanged. The cable was reterminated with a new T-body but the PD performance was still unchanged. To be conservative, the crew finally cut off approximately 7 meters (20 feet) of cable and spliced in a new section and termination. Upon reassessment, the cable was found to meet the manufacturers’ standards. The defect was discovered to be a small protrusion through the outer semiconductive layer about 15 cm (6 inches) below the semicon cut-back caused under the installation process. This case illustrates the point that even serious installation damage can not always be identified with a quick field inspection. 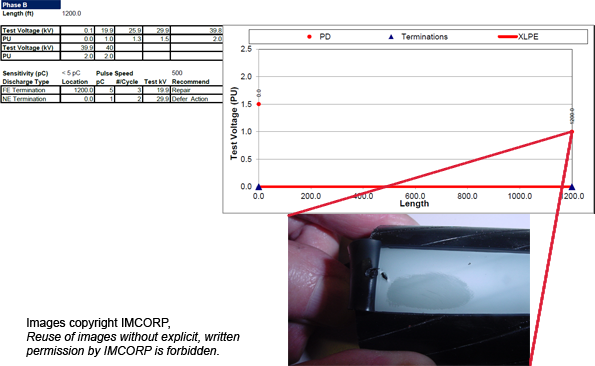 Note the magnitude of signal from the partial discharge activity in this defect was extremely small – only 5pC. Less sensitive tests would not have been able to detect the existence of this defect, though it clearly is an issue that would impact the future performance of the cable system.